This immaculate 3 bedroom villa is located in the unspoilt Argaka area – stunning private infinity swimming pool – large roof terrace with glass railings, pool table, BBQ area - landscaped gardens. 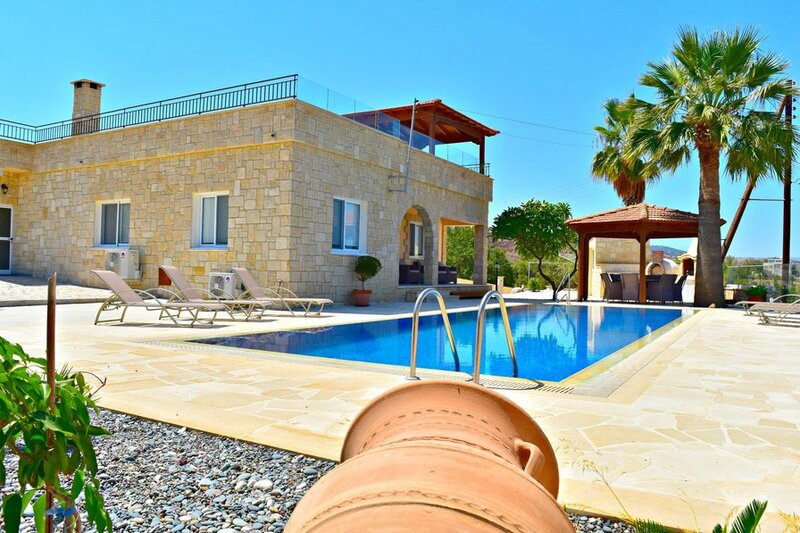 Having a backdrop of the Paphos mountains and pine forest and situated just a short walk to the quiet Argaka beach, this 3 bedroom Argaka villa is well equipped and offers spacious and tastefully furnished accommodation with large private grounds and own infinity swimming pool. Spectacular sea and mountain views from the generous balconies. The town of Polis with its good selection of bars, restaurants, tavernas and shops can be reached in less than 10 minutes drive, while a small selection of local tavernas in Argaka - within a few minutes drive completes the promise of a memorable, relaxing holiday. - Bedroom 1: Double-bed bedroom fully fitted. Patio doors leading to the pool terrace and garden. - Bedroom 2: Double-bed bedroom with patio doors to large shared balcony. Magnificent sea views. - Bedroom 3: Twin-bed bedroom fully fitted with patio doors to large shared balcony. Stunning sea views. - Stunning private infinity swimming pool. Shaded and sunny terraces furnished for alfresco dining. Location type Situated in the quiet and unspoilt area of Argaka. Refundable breakage deposit of €250 required on arrival, to be refunded on your departure (subject to satisfactory property inspection). Air conditioning is optional and charged locally at €6 per unit per day for the bedroom units and €8 per day for living area units. Argaka is an unspoilt Cypriot village situated between the sea and the mountain slopes. It is home to many good restaurants. Argaka has a sandy beach with clear warm sea. Views of the sunset over the Akamas Peninsula are outstanding. The tavernas are welcoming and very good value and there are two small supermarkets. About 10 minutes drive from the villa lies the small town of Polis with its attractive main square where it is a pleasure to linger with a cool drink and enjoy the relaxed atmosphere. The town offers many restaurants, bars and cafes as well as a bank, post office, pharmacy, hairdresser and many interesting shops. Just a few kilometres further west is the small town of Latchi with its attractive harbour and well known restaurants serving a wide choice of food including many varieties of freshly caught fish. There is a water sports centre and boat hire. Within a few minutes drive are several local tavernas and an Irish bar offering live entertainment and reasonably priced meals. There is also a bakery and 3 mini markets in the village or travel 10 minutes by car to Polis for the main supermarket and a variety or good restaurants and banks. Latchi is about 15 minutes by car and worth a visit for a good selection of restaurants serving freshly caught fish in the harbour.